This blog started as a outlet during some very challenging times in my life. I hope it provides some form of inspiration as the reader follows my journey from tragic circumstances to a place of well-being. Yesterday my Dad shaved my head to be a smooth as a baby's bottom. I'm sure he never thought he'd be doing that to his daughter in this lifetime. It made me reflect how with extreme situations we do things we never would have dreamed of doing. For example, I ended up giving my husband needles of a off-list drug that was being given to him by an alternative cancer treatment doctor. The home nurse couldn't do it because it was an off-list drug. Nonetheless, I abhor needles and the thought I'd be administering needles to a loved one is something I would have never dreamed of happening. Of course, I would have never dreamed (or even nightmared) the circumstances of my life in the past few years. 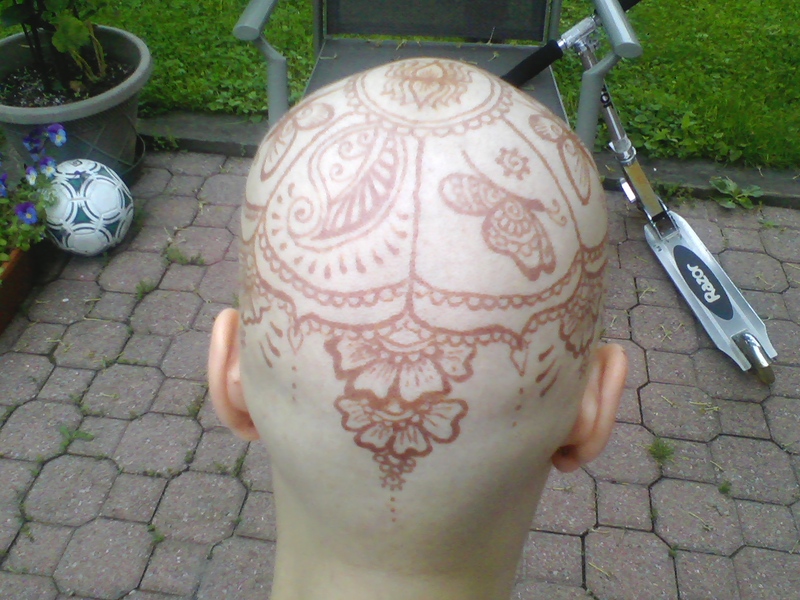 That aside, why did I have my Dad shaving my head? 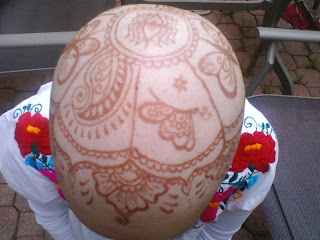 To have a henna crown of course. It was on a whim, I noticed this Facebook ad for http://www.hennaheals.com/ and I thought that sounds interesting. So I checked it out. Apparently this new start-up company was looking for people to volunteer for henna crowns in exchange for pictures and a survey filled out. So I volunteered - by summer, with their official launch they will be charging for this service. I'm actually quite pleased with how it looks. And maybe I'll exchange the snow heart for one of these pics. This has to be the toughest aspect of having difficult life situations, telling/sharing with others. I keep feeling there is this look of horror in my friends, family and others' eyes when I share what is going on. Generally I'm a fairly open person, and it's not me to lie about what is going on in my life. In turn, this sense of not being able to share without the reflection (in other's faces) of "how can this be happening" often prevents me from putting myself out there because it is hard to share, and more difficult to see the reaction of others. What do I want? To know that my friends, family, colleagues, and others whom I share with are going to be positively supportive. To know that they will check in on me, since I don't always have the energy to reach out; to know they are thinking of me and sending out positive vibes; to treat me the same despite what has occurred in my life... I guess the sympathies of others kinda grate on me. I'd rather laugh about how absurdly difficult the curve balls are that life swings at us. I'm mean really, I lost the love of my life to cancer (thus far, though I can be optomistic that there could be a time in future that I could meet another fantastic man), now I have a bout with this disease (although totally different outcomes are anticipated as my husband had a rare cancer and I had a well researched, early detected cancer - "had" as it was removed with surgery months ago now); and my work is to help people emotionally to address trauma in their lives yet I have a whole big mess of my own emotions to sort through with all of this. I'm writing this post now because there are now two opportunities to meet with friends from long ago - well people I haven't seen in 10 years or more. One person I have agreed to meet - she doesn't know about what is going on, but I will share with her when she comes to town. The other is a group of friends from residence at university. There is a closer group within the larger group that knows of my diagnosis, the rest do not know. I guess I've taken the route of the closest to me knew right away, then others whom I'm likely to see, everyone else is on a need to know basis. I actually would like to go and see this larger group of university friends and look forward to hear what they are doing, but I don't want to bring down the conversation in our few hours at a pub with what all has occurred in my life. Nor do I want my closer group of friends being put in the place of fielding questions of how I am if I’m not there. I am tinkering with letting the larger group know ahead of time and sharing this blog. So there's time to digest and "be normal" by the time we meet and I can look forward to seeing everyone with a little less anxiety and feeling weird. So when I stomach the edginess of sharing, I will type up something to the university group and hope it goes well. Yesterday I posted about the dilemma of being a single parent and having a child who is sick and wondering at what point do I have my child stay with a family member. This decision made was primarily motivated by concerns over risk of infection. As it turned out, my sweet child was very ill and in the middle of the night wanted to come to my bed. That lasted for awhile and I ended up going to sleep on the couch. I found I was too concerned every time he breathed on me or coughed. Throughout the day, yesterday, I was constantly hand washing and sanitizing. My folks were suggesting I could find a facemask to wear to protect myself. Tomorrow when I meet with my oncolgist, this will be one of the questions I have to determine how much can I expose myself to and what should be my limits. What was my decision? Well after a rough night I knew my son had to be elsewheres. After throwing up 4 times this morning, my decision was quickly confirmed. I suspect that I should of had him stay with family sooner, but I really didn't want to have him not be at home. The positive thing is that I was really tired out from everything, so this afternoon I had a good long nap and tonight I will go to sleep early. Addendum: the oncologist says the general guideline is if my son is not well enough to be at daycare, he's not well enough to hang out with me. Today, my son woke up with a runny nose. In day to day life with a young child who attends daycare on a regular basis, not all that concerning. This is normal. However, as a person receiving treatment for cancer and knows, despite the "good drugs" that counter side effects, including increasing my white blood cells to normal levels despite the anticipated 30% drop caused by the chemotherapy drugs, I need to do everything I can do to prevent infection. I know there is the option to send my son to the grandparents, but I don't want to. I know that he gets the most comfort from me and he is most comfortable with being home. If it he becomes ill enough to be away from daycare, I suppose that is when I send him to the grandparents. Thank God for family who live nearby and are fantastic supports. I have been feeling I have not written in my blog in awhile. I started writing about perspective/attitude but I don't feel that entry is ready to be published; however, I do want to post something. I thought about this: what has been getting in my way to writing recently? Well, life. I have been going out and enjoying life. Today I was a terrific workshop with Reid Tracy and Cheryl Richardson (http://www.cherylrichardson.com/schedule/) on writing. I have been writing since I was a small child. My folks have poems I wrote in grade 1. I have been journaling on and off throughout life. Writing is something I have always done. And, recently with this sense that I should be writing more (encouraged by others who have been encouraging me to share) and sharing my experiences and what knowledge I have from them. The writer's workshop seemed like a natural thing to attend. And, well, after attending a full day workshop, making dinner, picking up my son, taking time to play in our backyard, doing our routine bath, and story time; I am exhausted. Yet this is typical of me. Yesterday I was at the Look Good, Feel Better program (https://www.lgfb.ca/). Wednesday I had help to clean up my house and I did some organizing and sorting too ans spend time with my husband's family. Tuesday I realized there were more pieces of stuff to do (pay bills, complete the census, calls to make, grocery shopping). Monday I enjoyed the company of a colleague who shares my love of the arts and my larger family had dinner together. I think I decided to share some of my day to day activites because this is a reflection of what keeps me going. I have been really engaged in what I love to do. This also includes an expressive arts class that I have been participating in too. I think all these self-care activites and social activities with loved ones increase my energy despite chemotherapy. I still need to be careful not to get carried away and extend myself too much. But I figure I must be doing something right as everyone keeps telling me I look great; often people are surprised I am in the middle of chemotherapy. That said, I know everyone is different, and this is just my experience in how to keep my energy up and keep feeling well. Time for bed after a very full day. I am finding that being my best advocate keeps coming up with my experiences within the health care system as well as to engage the supporting resources. There is a lot out there to support me, but getting the services to coordinate or to provide the resources that I could best benefit by has been somewhat difficult. And, keep in mind, I have experience working with “systems” as a social worker and through advocating for my clients. I am left wondering what others do if they are not in positions as myself: i.e. being fairly alert, mobile, not bogged down too much by the side effects of treatment, and having the wherewithal to access these systems and be persistent. Probably persistence is the most important aspect; persistence without expressing frustration, but gratitude for the services provided. Let me share some of the places where I have been advocating. I somehow suspect this is not uncommon for anyone encountering the health system in Canada and trying to coordinate the myriad of supports. Recently I received a notice from Employment Insurance (EI) that my payments would stop (it has reached 8 weeks) but I know I am entitled to 15 with proper medical documentation. I know I provided the proper medical documentation already; and I managed to have this copied and stamped as received when it was submitted to my EI office. So upon receiving this information meant another trek to the EI office with my stamped medical certificate in hand. I meet with the worker who informs me that their system does not like to have more than one medical certificate and this is why my claim looked like it was to be ending. However with this sort of medical treatment, I could only have more than one certificate. Back when I was initially diagnosed I thought this would be an issue and I was wondering how to avoid all this. I went to my GP just before my surgery – who did not even know about my diagnosis from the high risk centre that I was using. So my GP could not provide a medical certificate. I then went to my surgeon, who after some time of holding the paperwork completed a medical certificate based on the surgery but not my ensuing treatments. That certificate took me to the end of March, but I did not meet with my medical oncologist (who would be able to write a certificate on the prescribed chemotherapy treatment) until a few days after my surgeon said I’d be “recovered” from surgery. So this facilitated a trip back to my GP to get an intermediate certificate until I could get one from my oncologist. When I met my oncologist, he quickly completed the needed longer term certificate so I could then submit a third piece of documentation to EI. This is what I needed to do to ensure that I had documentation showing I was entitled to 15 weeks of sick leave for EI. Fortunately I had a great worker who “sweet talked” the appropriate person to quickly approve the most recent medical certificate. This is just one example of what kind of run around seems to be typical to achieve anything that would help me within the system. I did a similar run around for putting my son’s daycare subsidy into special needs and to reduce the amount that I am paying (which is actually still in process). Part of the daycare subsidy is to know my expected annual income, which in turn meant I needed to get an estimate from my long term disability which I had not yet been approved for and had not yet a case manager assigned (although given the circumstances, they could assure me that I was likely to be approved). I’m sure one can imagine the rigmarole that emerged out of this situation. What I keep wondering about is how folks who are not as privileged as myself, those who don’t have Long Term Disability, those who are not as well educated or whose have English as a second language. I wonder how they fair under similar circumstances. I understand that after 15 weeks Ei, there is only welfare as the option for those who don’t have any other forms of coverage. I know it takes about 6 months to obtain Special Disability in place of welfare, and likely that needs to be seen as a long-term disability. How does that work for someone doing chemotherapy, radiation and likely to survive the cancer diagnosis. That is certainly not enough to survive on. Does that put people in places where they are losing their homes while attending their health? I hear constantly from the medical professionals the importance of reducing stress. How does this reduce stress and how does promote better health for our communities? Just wonderin’.